A large rectangular patio allows for the creation of distinct outdoor rooms and lends itself to entertaining groups. Blue Ridge Landscaping in Holland, MI. 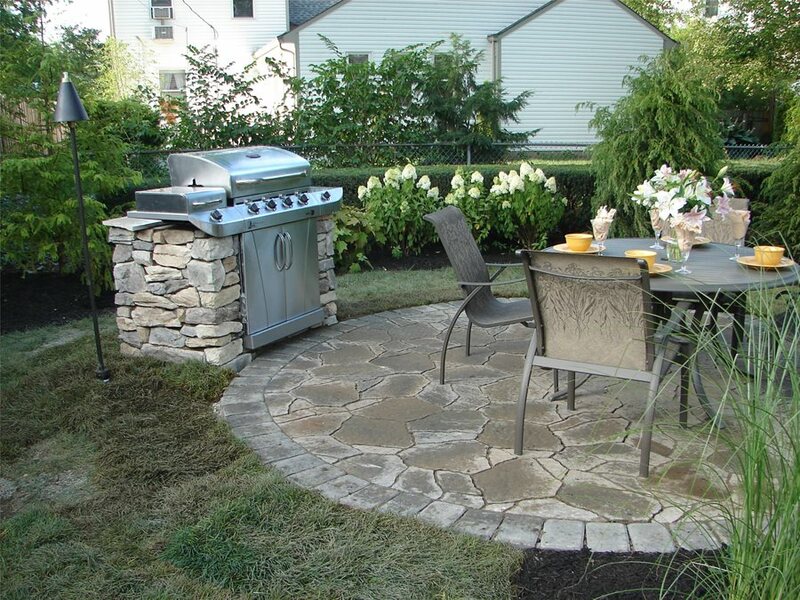 This small round patio is perfect for outdoor dining. S.A.T. 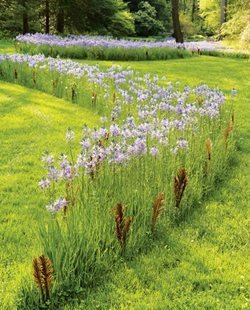 Landscape Services in Columbus, OH. Free-form patios are asymmetrical and unpredictable, creating an informal feel. DC West Construction in Carlsbad, CA. Patios are unique because their design is not limited by the need for walls and ceilings. Unlike rooms inside your home, they don't have to conform to the standard box-like shape. Designing a patio can be quite exciting when you realize how much freedom you have. Your patio can be a square, a rectangle, a circle, a free-form design, or even a series of interconnected shapes that work together as a whole. 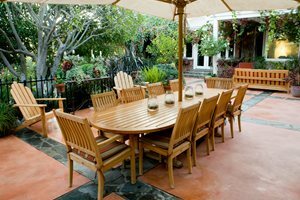 Once your patio shape is defined, get tips for determining the best patio layout for your furniture and amenities. You'll want to make sure the patio shape you select is well suited to your needs and the setting. Spend some time looking at photos of various patios in magazines, books and on the web. The most common patio shape is a square or rectangle. While this design is not the most creative, it is often the most practical and cost effective. Square patios, featuring straight edges and ninety degree angles, fit well into formal and contemporary style gardens. 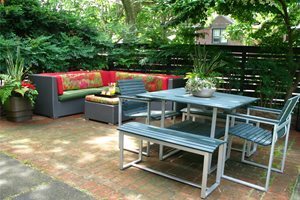 A square patio is excellent for entertaining large groups. 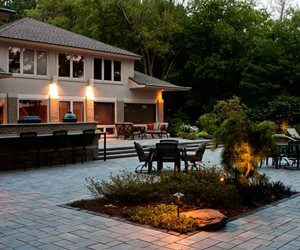 If you choose to go with a large rectangular patio, consider designating different areas by changing the paving material. 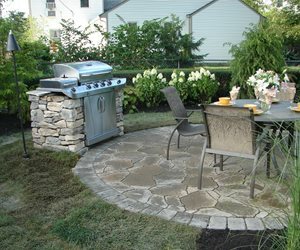 Smaller square patios are commonly used for a bistro table or hot tub. Pavers and bricks can easily be laid in a square pattern. Cut stone is another popular paving option for a rectangular patio. Round patios are also quite popular. Often, a round patio will feature a focal point at the center. 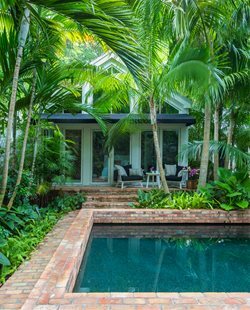 Sometimes this focal point is a circular dining table and chairs, other times it is a fountain, fire pit or built-in spa. There are two main types of round patios - a full circle design, or a half circle design. Full circle patios often exist independently and serve as a destination that draws people out into the yard. 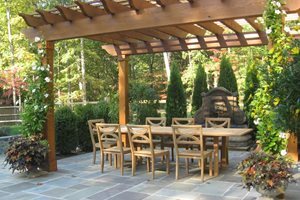 Half circle patios typically abut a building or other hardscaping surface. Rounded patios blend naturally into the surrounding landscape because they don't have hard edges or sharp angles. Pavers and bricks are excellent paving materials for round patio designs because they can be laid in a circular pattern. Many manufacturers offer pavers specifically for this purpose. 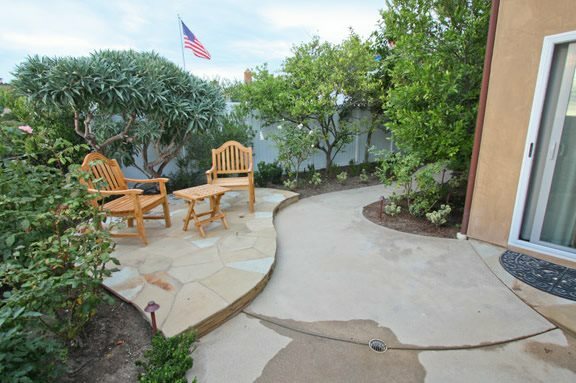 The shape of a free-form patio is much less predictable than the shape of a square or round patio. Some free-form patios are characterized by broad, sweeping curves, while others are characterized by unpredictable angles and shape changes. 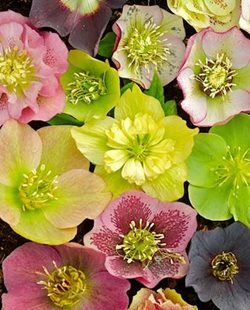 A free-form patio should be asymmetrical and have an organic feel, making them appropriate for informal gardens. 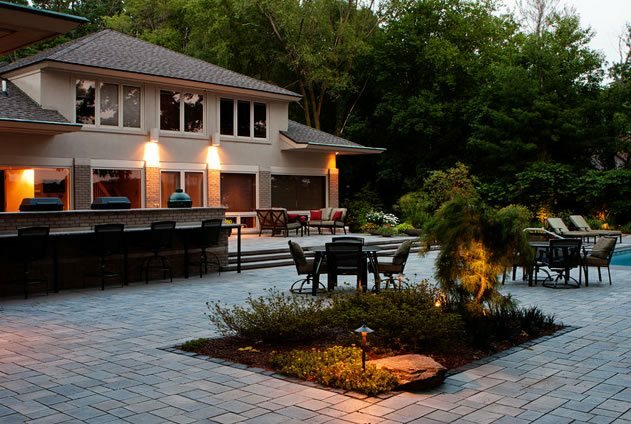 Concrete is a great paving material for free-form patio designs because it can be formed into any shape you desire. 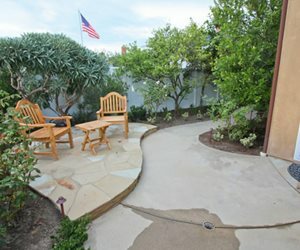 However, in the hands of a paving expert, flagstone and oversized pavers can make for a very unique free-form patio.